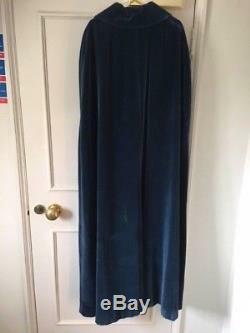 Beautiful teal blue long vintage cape, cotton velvet, fully lined in a brighter blue. Excellent condition, smoke/pet free home. Collar can be worn up or down, fastens at the top with two large and one small button, side armholes. 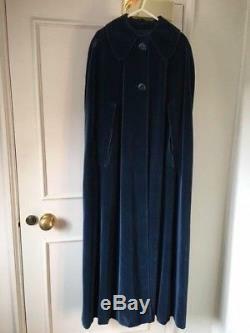 Approx size M/L, up to UK 16. Measurements laid flat and fastened, chest across 22 inches, length back neckline to lower hem 54 inches. 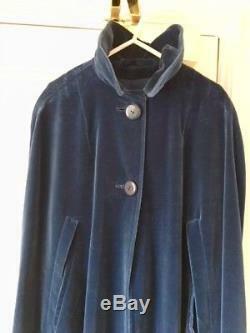 See my other listings for some vintage Laura Ashley, Gudrun Sjoden, Georgina von Edzdorf and more. 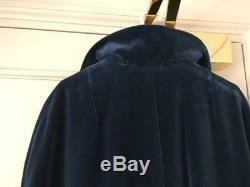 The item "Dramatic teal blue cotton velvet cape, cloak, long lined, vintage vgc" is in sale since Friday, October 19, 2018. 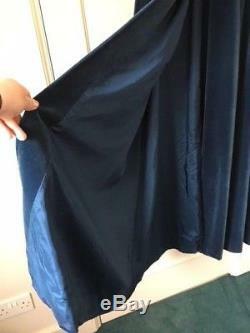 This item is in the category "Clothes, Shoes & Accessories\Vintage Clothing & Accessories\Women's Vintage Clothing\Coats, Jackets & Waistcoats". The seller is "delphic-oracle" and is located in Glossop.